Do you want to enhance your home with the finest brick fence or automatic gates? Custom Brick Fences can help you! 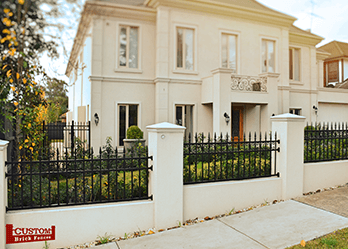 We supply fences all over Melbourne, from the CBD all the way through to Hawthorn. Brick fences and gates are our specialty, so you can rely on us to stock what you’re looking for. 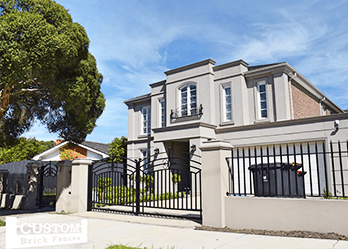 Whether you want to update your home with a steel or brick fence, security gates or even a wrought iron gate, Hawthorn locals can guarantee we’ve got their ideal fence or gate. Like our name suggests, we’re the go to store for Custom Brick Fences. We offer a wide selection of fence designs for your Hawthorn home. Brick fences are available in various styles including coloured render fences, brick and steel fences, a brick fences with steel pickets, spears, fins, slats or panel inserts made of metal, wrought iron or timber, or a feature wall. If you are interested in adding an automatic gate for your Hawthorn home, we can custom-design any gate according to your taste and requirements. When it comes to choosing your gate design, the options are endless. Apart from our great product range, we also specialise in installing new fences and gates. Hawthorn home-owners will benefit from our years of experience in the industry, which enables us to provide thorough and honest advice when you’re deciding on the perfect fence or gate for your home. Need a new brick fence or gate? 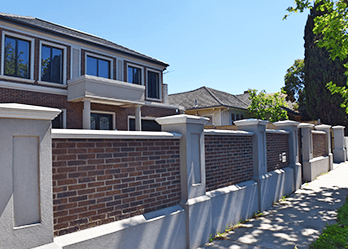 Hawthorn locals can rest assured Custom Brick Fences has what they need. 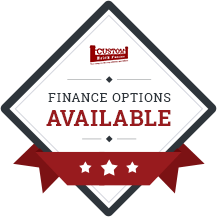 Call us today on 1300 88 68 38 or 03 9874 5102. In addition to Hawthorn, we also provide services in Canterbury, Doncaster, Essendon, Glen Iris, Glen Waverley, Hampton, Kew and surrounding suburbs.